Owned by Robert and Sue Wood since 1986, Court Barn Hotel and Restaurant in Holsworthy is a romantic 17th century country house set in five acres, with unspoilt views across Devon countryside, has six individually furnished bedrooms and a multi-award winning restaurant. 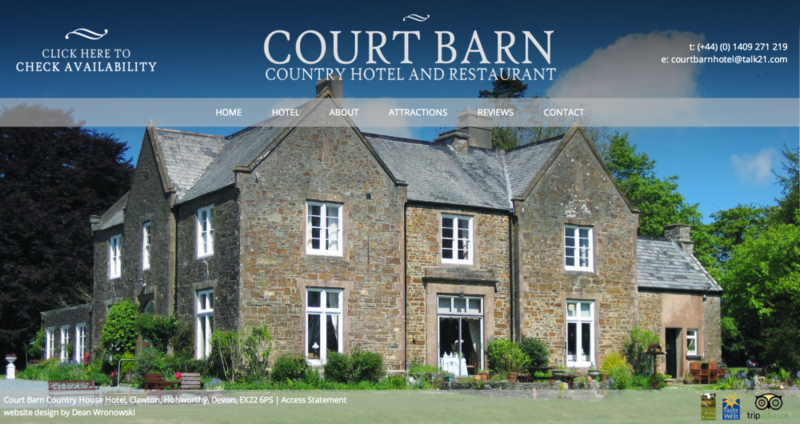 The first task involved providing a series of website designs for Court Barn in Holsworthy, and with the help of the client’s research (initial sketches), the overall process was made simple. The website design that was produced was simple, easy to understand and most of all, memorable – exactly as they wanted it. The website itself was built using standard technologies such as jQuery, php and xhtml. Some seamless animations were however embedded to give users a more friendly experience. The end result was one I was really, really pleased with. If you would like to stay in wonderful peaceful hotel then look no further – Court Barn Hotel and Restaurant in Holsworthy.